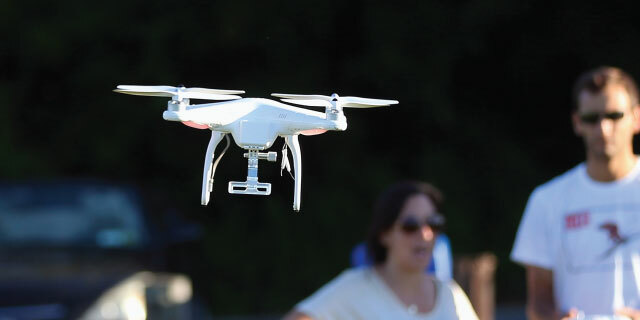 Drones are catching on as consumer goods. As of mid-2017, 8% of Americans say they own a drone and 59% say they have seen one in action, according to a Pew Research Center survey. But while drones – that is, aircraft without on-board human pilots – are more prevalent than they were a few years ago, many have reservations about where and under what circumstances their use should be allowed. The survey shows modest differences in rates of ownership by gender and age. Slightly more men (11%) than women (6%) say they own a drone, as do more people ages 18 to 49 (12%) compared with those 50 and older (4%). Americans vary in how they react to the sight of a drone nearby and what rules they think should be applied to them. Asked how they would feel if they saw a drone flying close to where they live, relatively large shares of Americans say they would be curious (58%) or interested (45%). At the same time, around one-in-four (26%) say they would be nervous, and around one-in-ten say this would make them feel angry (12%) or scared (11%). When it comes to what rules should apply to drone use, roughly half the public (54%) thinks drones should not be allowed to fly near people’s homes. Just 11% think this should be allowed, while 34% think it is OK in certain circumstances but not others. Around half of the public (53%) says private citizens should not be allowed to pilot drones near accidents or crime scenes, while a plurality (45%) says this practice should not be allowed at public events like concerts or rallies. 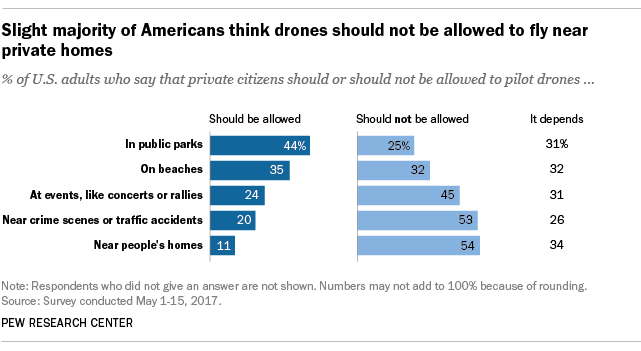 By comparison, Americans are more broadly accepting of drone use by private citizens in locations such as beaches or public parks. Still, a significant number of Americans do not have hard and fast rules about whether people should be able to fly drones in various locations. For each of the possible locations for drone use asked about in the survey, roughly one-quarter to one-third of Americans say it depends on the circumstances as to whether citizens should be allowed to pilot drones in that location or not. Older Americans often have substantially more negative – and less permissive – attitudes toward drones than do younger adults. For instance, 25% of 18- to 29-year-olds say they would feel indifferent if they saw a drone flying near their home, but that share falls to just 6% among those 65 and older. By the same token, just 5% of young adults – but 17% of those 65 and older – say they would feel angry in this situation. 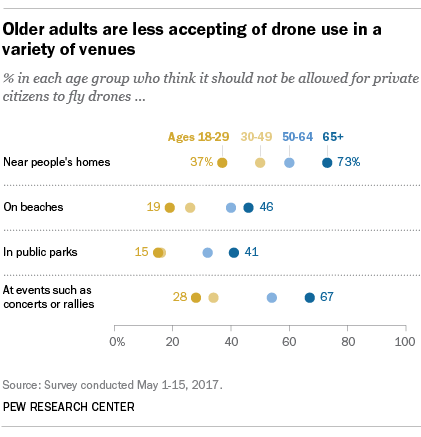 Older Americans are also much more likely to think that drone use by private citizens should be banned in certain areas – most notably, near people’s homes (73% of older adults think this should not be allowed) or at events such as concerts or rallies (67%). Government data provide other indicators about how drones have worked their way into everyday life and instances where they have been used in areas that are off-limits. As of May 2017, more than 820,000 operators had registered their unmanned aircraft with the Federal Aviation Administration, according to FAA Administrator Michael Huerta. That number represents only a portion of the drones in use, because until recently, FAA rules stated that only drones weighing more than 0.55 pounds had to be registered, and many consumer models did not meet that weight requirement. Additionally, reports to the FAA of drone sightings in unauthorized areas have grown in recent years. The agency has been tracking reports of unmanned aircraft sightings around planes, airports and other unauthorized areas since November 2014. A Pew Research Center analysis of those data shows that through the first nine months of 2017, the FAA had received an average of 155 such reports per month. This represents a 24% increase compared with the same time period in 2016, and an 86% increase compared with the same period in 2015. Note: A sentence in this post on FAA rules was updated on Jan. 4, 2018, to reflect recent congressional action. See full topline results and methodology here (PDF).